Yet another recall has been reported. Here's why it matters for pregnant women. Texas-based Garland Ventures has recalled over 100,000 pounds of chicken fried rice due to Listeria concerns, according to the Food Safety and Inspection Service. The rice sold was not fully cooked and was packaged in shelf-stable pail boxes between September 24, 2015 and March 23, 2016. 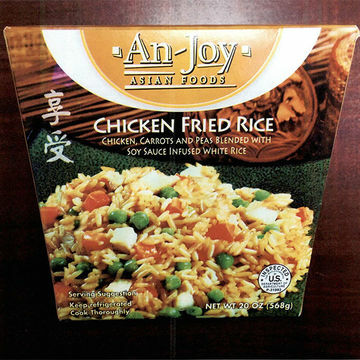 The products were labeled as "ANJOY Chicken Fried Rice" and branded by AllFresh Foods. If you have this item in your home, discard it and do not eat it, especially if the item has one of the following codes: 092415, 092915, 100215, 101325, 101615, 102015, 102715, 110315, 110615 and 032316. It's also a good idea to wash any surfaces that the product may have touched. Listeriosis is a serious infection associated with the consumption of Listeria—and pregnant women are at greater risk for it, with a 20 percent higher chance of becoming ill. Symptoms include nausea, headaches, vomiting, chills and convulsions. On a more serious note, Listeriosis can cause miscarriages, stillbirths, infection to fetus and premature labor, so it's very, very important to exercise extreme caution before eating ths product that has been recalled.